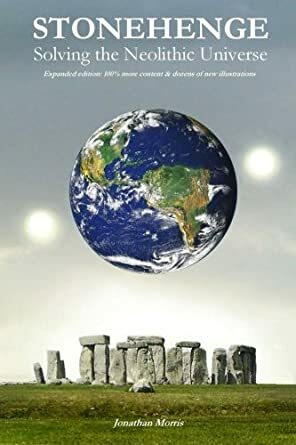 Description: Stonehenge - An introduction to the concept of the Heavens’ Hinge By Jonathan Morris CEng FIStructE FICE This introduction shows the mathematics and engineering behind the storyline of The Broken Stone and the secret of the Heavens’ Henge. The images in the following text were produced using a three dimensional computer model which was found to replicate the stones at Stonehenge as they may have been when first constructed. Stonehenge’s plan layout is shown to be the same as an idealised geocentric description of the Universe. Its inner stone monument is demonstrated to be capable of producing a spectacular public display of solar movement. The arrangement of this system is shown to be based on a simple method of tracking celestial objects. The contention of this paper is that Stonehenge was both a depository of knowledge about the Universe and a place of learning designed for popular interest. Thanks for posting this, extremely interesting. Currently working with my wife on the alignments at a previously undiscovered monument (sorry, can't say where yet), and the latest on Stonehenge is good comparative material, the 3D aspect is particularly useful. Better illustrative graphics (though black and white in the pdf) hopefully make it a bit easier to understand. The full version also covers some monuments in East Sussex. Over here in Sussex, we've partially completed a working scale replica of the system. Should be fully working by the summer. We thought that this might be suitable for a festival, but happy to be guided by any comment. It was plausable enough for me. That's a great project Envisager, thanks for sharing it. Thanks Dathi. We're not sure whether or not to demonstrate it publicly or whether to do the whole thing on-site and record using time lapse photography together with real-time video. On-site is easier, particularly to get good shots, but maybe something like the Lamma festival could work really well. On the one hand, if this could (even potentially) be part of the heritage of the Druids, then perhaps it should be done off-site (publicly) so that people can see what it is (seeing is believing and so far only a few journalists have seen it). If it is academic and perhaps more about the distant past before the Celtic influx, then perhaps that's different? Most interesting thing is that I'm finding out stuff I didn't know. The lozenge shaped reflections on the inner face are useful: Because the inner surfaces of the Trilithons have been worked to be flat, you can use the reflections to see if the mirrors are focused rather than having to eye-in all the mirrors from the hinge. It's a much easier way than I had been using. But it needs flat worked surfaces so I doubt there's a commercial application to today's comparable systems. 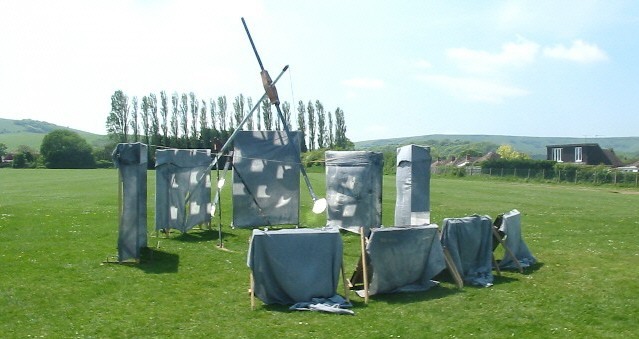 PS I forgot to say why I've put all this up: Had a Professor of Archaeology (and an expert in Stonehenge) write to say he agrees that it was a working model of their Universe. Also will be demonstrating it to an archaeological forum, who've asked to see it running. Recent Stonehenge books have poo-pooed the idea of the Druids being involved in Stonehenge on the basis that Druids were Celts and the builders of Stonehenge were an earlier period. However, I can't see how the history & knowledge would not transfer through to the Celts, perhaps even in its entirety. I thought that seeing this might be of interest to the Druid community but haven't got much feedback so am not sure. I'm updating the research with detailed references. Probably will include Avebury as well. The work suggests that the druids may really have known all the Caesar ascribed to them and that their history goes back far before that time. Looking forward to Lammas this weekend! I've completed the update of this now: The expanded print edition has 156 pages, 114 illustrations and 243 notes cross-referencing to 46 reference works on Stonehenge. Some good reviews to date!